Why Sir, You’re a Dandy Gentleman, You Surely Don’t Listen to Hip-Hop?! Does musical taste affect style or vice versa? Or are people too quick to judge when a person does not adhere to what is perceived as the style of dress of avid listeners of a particular music genre? Now, why would one presuppose that neither Mr. Theodore nor his coterie of friends and associates listen to hip-hop simply because they’ve traded baggy jeans and hoodies for wool trousers and newsboy caps? Statements like these just go to show how personal style is like a double-edge sword: while style serves as a means of self-expression, it can also lead to misrepresentation, and stereotyping. Mr. Theodore explains that his mission is to redefine black urban street style, and expand hip-hop fashion beyond the sagging jeans that define it to this day. Perhaps sartorial typecasting isn’t as prevalent in other circles. Surely, I doubt anyone questions the allegiance of country music enthusiasts or jazz pundits based on whether they sport cowboy hats or thick-rimmed glasses. But for urban peacocks, who dare stray from the sartorial model, that’s a whole other story. I can’t think of a music genre that holds as much sway as hip-hop. No other music genre has led to branding the way hip-hop has. Urban clothing lines, urban alcoholic beverages, urban jewelry, all elements which have transformed hip-hop into a lifestyle. Perhaps this is why Mr. Theodore’s work is so important. Letting people know that modern day dandies are also part of the urban landscape will begin a dialogue about style and culture, and hopefully spread the message that no one style of dress should come to define an entire community. Great post Katia. I’ve also noticed the disconnect in the perception of the urban dandy and how he/she fits into urban culture at large. An instance where “diversity” is actually pretty narrowly defined, no? Ironic. I also love what Theodore has been creating in his atelier and the originality of his boutiques. Big fan of Brooklyn Circus. I couldn’t agree more. On the upside, Mr. Theodore is inspiring a whole new generation of urban tastemakers. Slowly but surely, the urban dandy will carve his rightful place within the urban landscape. 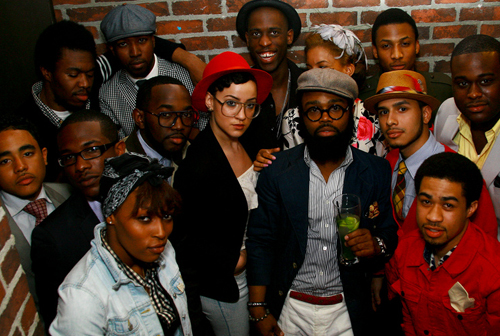 I see no reason why both styles can’t co-exist, although clearly I’m partial to the urban dandy. There’s just something about a man with such a polished, carefully crafted, and singular aesthetic. Thanks for your input, Mariah.